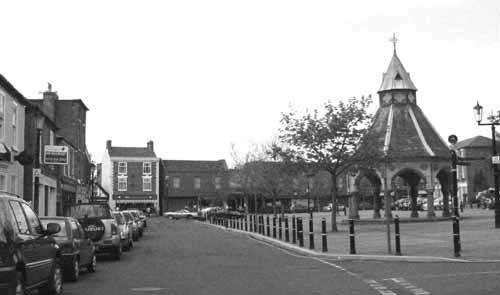 On the left is an oblique view of the buildings on the south side of the Market Place starting at No. 27, now the National Westminster Bank, No. 28, Cranmer House and Nos. 29-31 the hairdressers and furnishers shops. Then comes the only four storey building in the Market Place, No. 32, that is now a flower shop. For more information on Nos. 27 to 32 Click here. The shops and houses beyond the present ‘Flower Shop’ to the corner with Market Street were demolished in the early 1960s to build the Co-op. For a better view of these before demolition click here. The buildings seen ahead, on the west side, start with part of the gable end of No. 2 Market Street. In 1910 the single-storey building was Downing’s, later Hopkinson’s, butcher’s shop and is now part of the DIY Handicentre. Next door is No. 1 Market Place, the shop front with a gas lantern bracket would have been Edwin Hitchcock, watchmaker and jeweller in 1910 and in 2003 is Bird’s bakery. On this frontage, white paint has been used to pick out the decorative timber (not stone!) window lintels and to imitate cornerstones (coigns/quoins) at the sides of the facade, that were not there in 1910. This echos a similar pattern in stucco work on No. 10 Market Street, the side entrance of which is No. 1 Union Street. Not surprisingly, the Buttercross, always features in views of the Market Place. It was erected in 1861 to the memory to John Hassall the Earl of Chesterfield’s popular land agent. To see a detailed view of the inscription around the Buttercross click here. Many of the buildings on the western side of Market Place were cleared in the late 1960s to erect Eaton Place, only Nos. 11 and 11a remain, towards Newgate Street, giving some idea of the appearance of the earlier buildings. On the north side, partially hidden by the Buttercross, are Nos. 13, 14, 15 & 16. For the rest of the 1910 postcard, the Market Place is unpaved. The first paving was laid in 1960, since then it has been subject to a number of alterations. This viewpoint combined with other pictures looking north-east or east and east from the corner with Market Street give a nearly complete 360 degree panorama of the changes that have occurred around the Buttercross over the past 100 years. 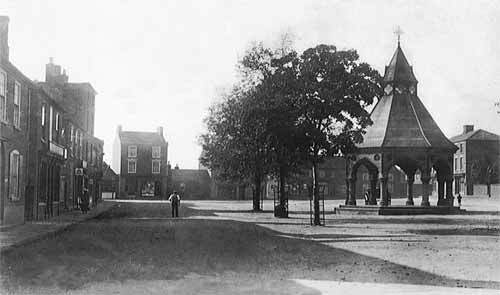 In all these c.1900 views, the Market Place looks more spacious without the parked cars and street furniture. This viewpoint adds more information to the glimpse of the Market Place given in the picture taken outside the Chesterfield Arms in Church Street.